Skype is a free web-based communication tool which allows people to video conference, make calls, and instant message. Skype has more than 300 million active users all around the world (see 24 Amazing Facts about Skype). Skype provides a variety of educational opportunities for classrooms. Students can connect with other students, increase their knowledge, and interact with other cultures. They can use Skype to share projects, polish their language skills, exchange information about particular books with students who read the same books or present their dissertation to their committee. 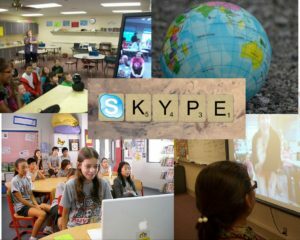 Skype also provides students and teachers with the opportunity to participate in virtual tours of historical places, communicate with authors and researchers, and engage in conversations with classrooms around the world. In these case, Skype provides a simple platform for student development and growth. In addition, Mystery Skype is the educational game which many teachers can use it in their Language, Geography, History, Science. Two classrooms can call each other on Skype globally and ask questions which related to the class. Mystery Skype is both fun and instructive game for learners. However, it should not be forgotten that time zone differences might be an issue if you connect with educators, students, and interesting people across the world. Price:Skype is technically a “free” community-based software if you use it with devices which have Skype application. However, if you want to get a phone number with the country code in which you live, you have to pay a little amount of money. Ease of Use: Skype main page is very simple and does not comprise a lot of information. Therefore, you can easily see sign up, download Skype, use Skype online, and help icons. After you click one of them, you can effortlessly keep track of directions and reach your goal. Skype has a seamless help page. They split the necessity information into the categories such as getting started, calling, video, account and payments, messaging, and everything else. It means you don’t have to think too much or spend a long time to get an assist. If you don’t know which category includes your question, you can use search icon and text keyword to find an answer. Furthermore, you can join the conversation and note previous discussion pertain to the topic. Designers: Skype was created by Janus Friis (Denmark) and Niklas Zennstrom (Sweden) in 2003. Then, Microsoft bought Skype, paying $8.5 billion. Accessibility: Skype offers voiceover, narrated screen reader, High-contrast settings, magnifier, and speech recognition to convert speech to texts to support people with hearing or seeing disabilities. Dr. Ruben Puentedura’s SAMR model offers a lens for examining how technology is adopted in a classroom. As you strive to incorporate online tools into your classroom, we encourage you to use this model as an analytic tool. Substitution: Students use a Skype to meet, communicate, and interact with other students online (instead of engaging in a face-to-face discussion). Augmentation: Students can join video conferencing, share their screens, and communicate with other students who live in the U.S or abroad and save their videos for future use. Modification: Students critically evaluate their thoughts on a specific content of readings or their knowledge. For example, American students read some books from Turkish literature and they can make a skype video call with students in Turkey. Turkish students mention their cultural norms in the book. Therefore, Americans can compare and analyze cultural differentiations. Redefinition: Subject matter experts, faculties, and famous people all around the world can be invited to join a class discussion and share their expertise. Mystery Skype provides entertaining and productive class teachers. Particularly, in the Geography, Language and art, Science, and Maths teachers can use it effectively. Learners make a video call in different part of the world and ask critical questions about their location. Then find students’ location playing a guess. Mystery Skype allows students to recognize of cultural awareness, speak with second language learners, and learn knowledge related to geographical features of the place. Remember, teachers should get permission students to show themselves on camera. Science: There are many opportunities to use Skype for STEM. Students can follow along with scientists as they build a new rocket or walk on a glacier in Iceland. 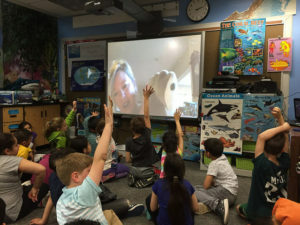 English/Language Arts: Skype allows both educators and students to connect with one another on a global level. Learners can find a chance to speak the foreign language with native speakers. In addition, students can meet authors and lecturers on Skype to get more information about writing and reading their own language. Skype in the Elementary Classroom! You can use Skype video call either clicking “Use Skype online” or “Download,” but remember in both situations, you should install Skype web plugin. Rock, M. L., Schoenfeld, N., Zigmond, N., Gable, R. A., Gregg, M., Ploessl, D. M., & Salter, A. (2013). Can You Skype Me Now? Developing Teachers’ Classroom Management Practices through Virtual Coaching. Beyond Behavior, 22(3), 15-23. Morgan, H. (2013). Technology in the classroom: Using Skype for exciting projects. Childhood Education, 89(3), 197-199. Foote, C. (2008). See Me, Hear Me: Skype in the Classroom. School Library Journal, 54(1), 42-43.